It's not being updated anymore of course. The old forum still works, but registrations have been disabled. I may adjust some permissions so the entire forum can be explored without logging in should anyone feel so inclined. Though all old accounts are still there for now. The links in downloads are broken since a long time. See this thread if you want to download the old worlds. Once upon a time, in ancient times, in a galaxy far far away, I used to run a minecraft server, sometime during the beta phase of minecraft. Not sure exactly when I got started. Unlike the current modded lets play server it had other players on it. It lived through the beta phase and until release 1.7 I believe. That's around the time it died for the last time. And it's been dead since. Occasionally I get asked about the old worlds, and I've kept some of them around. Recently it happened again, and I went through my files looking for them. Unfortunately it seems I should have made a proper archive of them instead of keeping them strewn about here and there, because it appears I've lost a few of them, which is a shame. But now I've organized the ones I do have left, and I'm going to link them here. I've gone through the world data trying to figure out when the worlds were from, but unfortunately the only date stored among the data is "last played", so I've noted that with each world. I've also gone into each of them in the current version (1.11.2) which has also converted the worlds that needed to be converted to the Anvil format. Some of them needed to have fire ticks turned off to keep buildings from catching fire, which I've also done. In the archive root there is a file called "World Contents" which contains a list of points of interest that I saw while checking the world, it also has the seed, and a list of players who've played in each world at some point (from the player data files, so they could just have logged on and logged off). Also included is a world containing "The Dungeon". This is the latest version of it, which I can't remember if it was actually used at any point, unlike the previous versions. But it is interesting because it contains cutouts of some points of interest from older worlds, like Trade Port, the Carnival and perhaps a few more. There is also a bunch of other command block mechanisms that powers the class system and some other things that you are free to explore if you feel like it. Getting around should be self-explanatory once in the world. The latest version of the 1.7 Beta world has been provided by that_kiwi and have been added to the folder with the others, also converted to 1.11.2 and with fire turned off. It turns out that was the world with tower town in the name, so now there are two versions of that. This application is meant to assist with calculating combat outcomes when playing Talisman, quite simply. Talisman is a board game/role playing game where you play as a character, move around a board-world collecting items and followers, fighting monsters and deal with events and the other players. You have two stats that determine your fighting prowess, "Craft" and "Strength". Strength obviously represents physical combat, while Craft represents mental combat. When facing a monster you must fight it on it's term, if it uses craft you must use craft, if it uses strength you must use strength. And of course various items and followers and abilities can boost these separately or together, and also depending on if it's night or day. All of these factors makes combat a bit slow since you need to re-calculate your total craft or strength every encounter to make sure you're using the right value. So, by using this you can add and subtract things from your character as the game goes along, and once you end up in combat instead of tallying your bonuses you can just pick the character and monster to fight in the app, then hit a button and you get the result of the encounter immediately. This is a work-in-progress still and isn't fully usable yet. There's some issues with data persistence, like the day/night state not being loaded properly. Oh wow. This thing. I haven't touched this in years now. It's terrible. Amazingly it doesn't look that terrible, but the way it's coded and the way navigating works is pretty awful. The way that logging into the admin panel requires clicking through a "you have logged in" screen is absolutely terrible. The concept is good however. I'd like to re-write this sometime and make it easier to maintain, add data and handle spam and such. It still occasionally gets spam entries. But significantly less than it used to, which is nice. In case you're wondering the basic idea is to provide a way to find where a specific game keeps its save files, so instead of having to scour the internet to find a post on reddit or something mentioning it you can just come here and see. No idea what the demand is for such a thing, but it was one of my first projects and at the time I really wanted such a thing. So, what is this thing I hear you asking. I've always found the idea of creating graphical interfaces in OpenComputers a bit intimidating. Since it requires keeping track of a bunch of numbers which is not one of my strengths. So once I'd gotten to a point where I needed a graphical interface I set out to create this application. I wouldn't call it much more than a prototype at the moment since it's barely usable and could do with some a lot of work to improve user-friendliness. It does work though. In essence what it does is it allows you to "draw" boxes on a representation of an in-game screen and it can generate fill code to draw those boxes with an in-game program. It also generates the conditions needed to test for click events within the shapes which can be used to create clickable buttons. Some of the things I'd like to improve at some point includes the way the code is presented and how color selecting works. I'm also going to change how the screen is drawn in a major way. 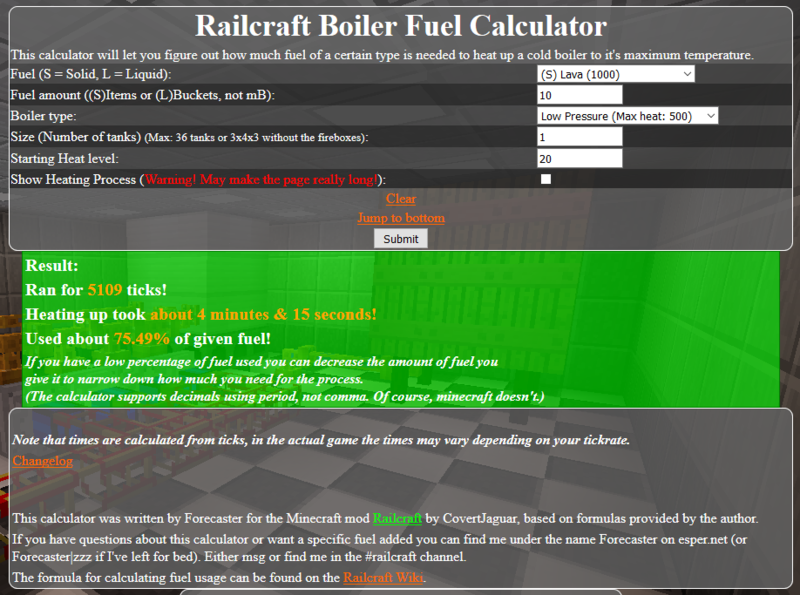 The boiler calculator is a project inspired by someone asking about the math behind the boilers in Railcraft (the Minecraft mod) years ago. They wanted to calculate how much fuel they'd need to produce to keep a boiler running. That made the want to create a web-application that could calculate that. And this is the result. It's gone through a few iterations in the beginning, which you can see in the history post. Currently it's in a state of feature freeze because I don't have anything I want to add to it at the moment. Optimally I'd like to do a rewrite of the front end at some point. Turn it into an API based system with a JS front-end, which could also open my system up to others wishing to make their own clients. Since it's stable that is not a priority however. 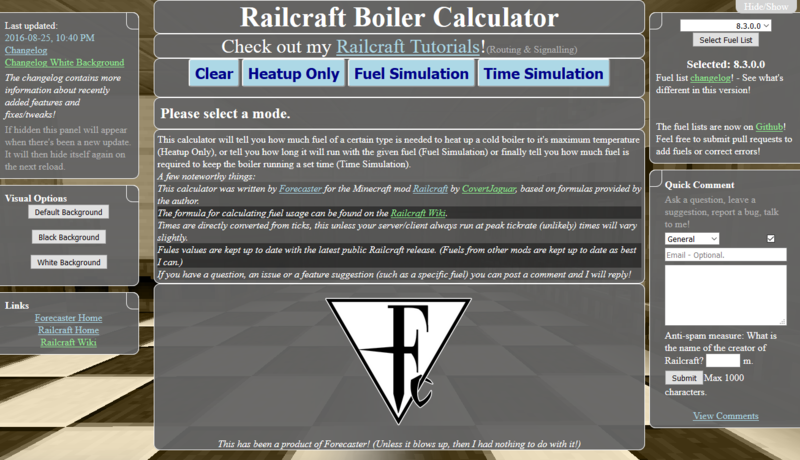 The Railcraft Boiler Calculator was initially conceived 2013-02-22 (Time of initial release) when someone asked about the math behind the boilers and wanted to use the formulas to calculate fuel use. 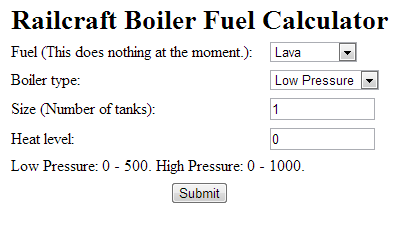 That gave me the idea to create a web application to allow people to easily calculate how much fuel they would need to run their boilers. Very simple, barely does anything. Just outputs the base fuel usage per tick for the number of tanks and boiler type you specify, as well as the fuel usage per tick adjusted for the specified heat level. Now capable of actually running a simulation of the heat-up of a boiler and report the amount of time it took and how much fuel it used it's much more useful. It could even output a tick-by-tick report of the heat increase and fuel usage. 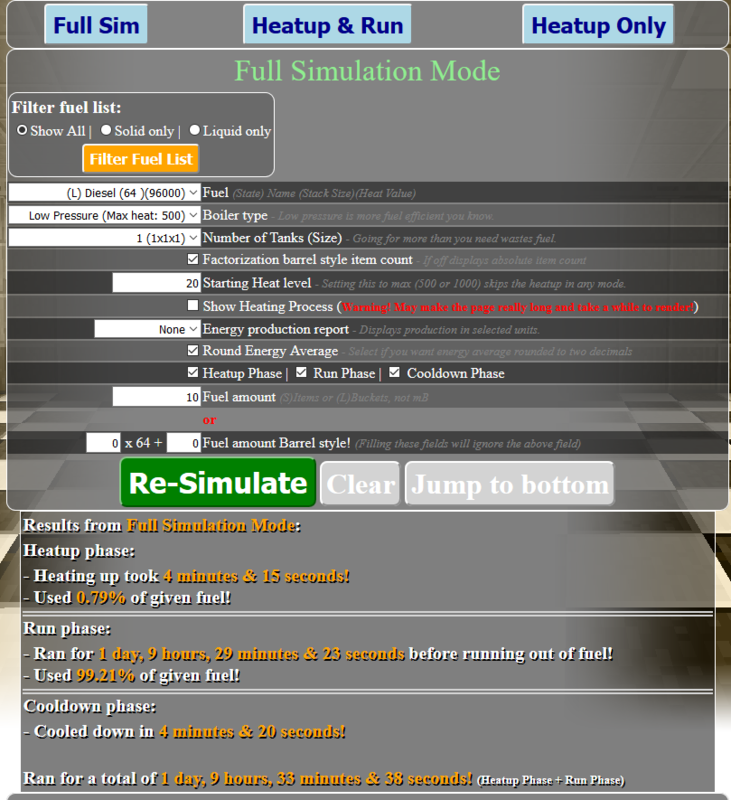 As you can see it now fully simulates the boiler, telling you how long heat-up took and how much fuel was used, then how long the boiler ran with the remaining fuel, how long it took to cool down, and finally the total run time (not including the cool-down) and how much steam (energy) was produced. The interface is turning into a bit of a mess unfortunately, but there's a few new features. Most notably the three different modes that have remained until the current version (although with different names). The first one, "Full Sim", is basically the previous version. You set the parameters for the boiler such as size and fuel and run it and it simulates the entire process and produces a report with times and fuel usage percentages. The "Heatup & Run" mode instead allows you to give it a time. It will then simulate the boiler for this time and then tell you how much fuel would be required to run the boiler for this time, as well as how much of that heat-up used. Not a lot of information, but pretty much what you asked for running this mode. The last mode, "Heatup Only" is pretty self-explanatory. 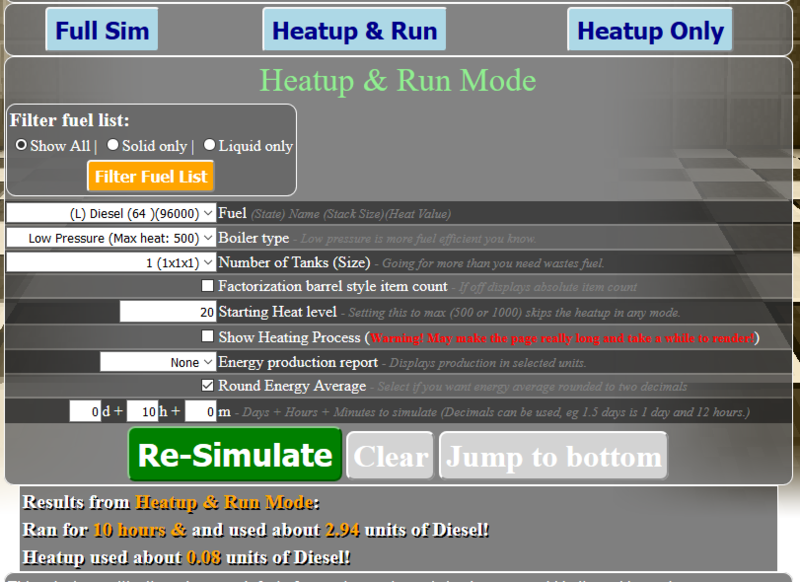 It's the "Heatup & Run" mode but only runs the heatup part and then reports the fuel use and time. 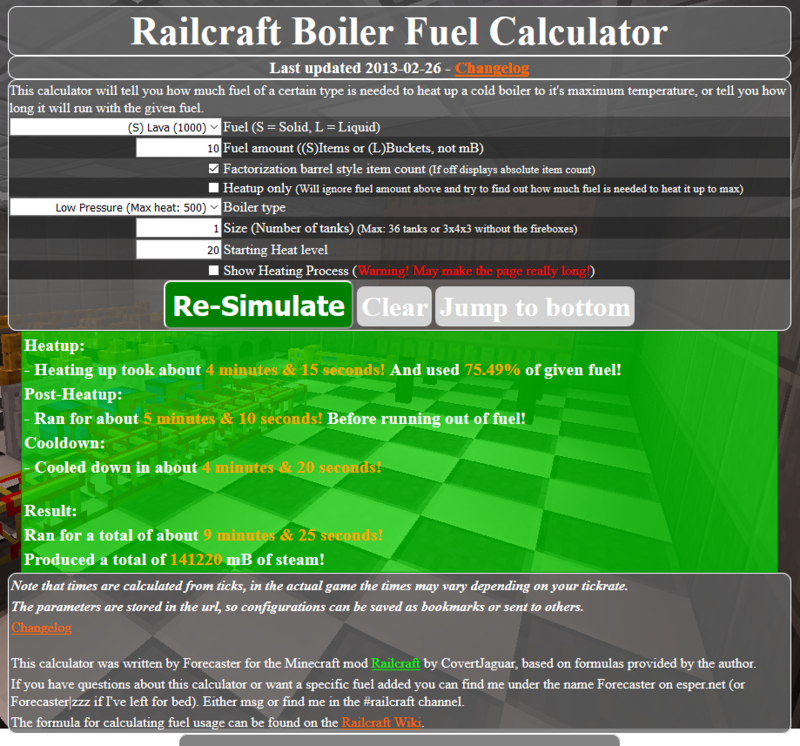 And now, the final destination, the current version the boiler calculator. I no longer like the design really. The code is garbage and pretty much everything could be done much better, except some core bits I rewrote fairly recently due to changes in how boilers works in Railcraft. Some day I'd like to do a complete re-write to get a better interface for it, and maybe it'll happen eventually. For now this is the current face of the calculator. You can give it a spin by going here! Hello! Welcome to my forum which is going to serve as an alternative to the comment system for the boiler calculator, and as the only way to discuss/comment on my other sites, services and videos/streams (except YouTube comments). Before registering I'll tell you the rules of this forum. If there isn't a specific section for something it probably doesn't belong here. If you like you can send me a pm requesting such a section to be added. Respect others and their opinions (even if they're stupid), don't get angry about things that don't affect you. Basic stuff.